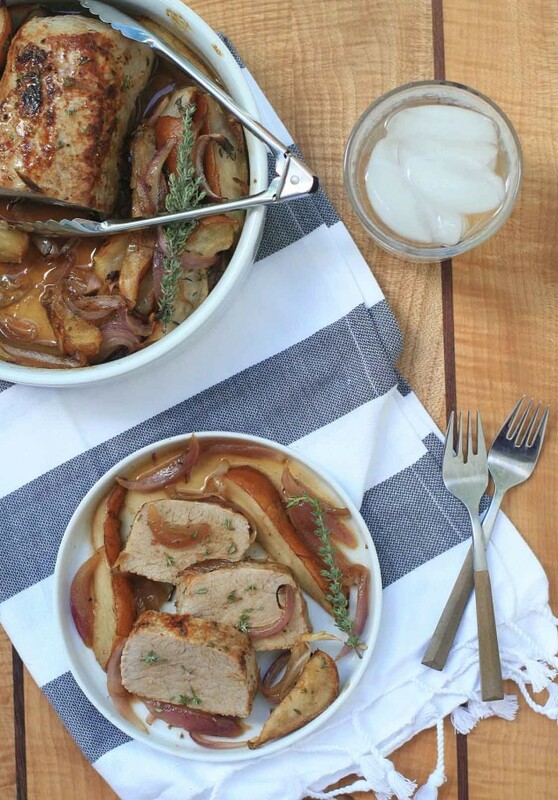 If you avoid cooking pork because of too many bad experiences with tough, dry and sad-looking pork chops, I’d urge you to shake things up and try a pork tenderloin instead. Even though it’s an extremely lean cut of meat, it should still cook up tender and juicy. Perhaps because it’s cooked whole rather in slices? 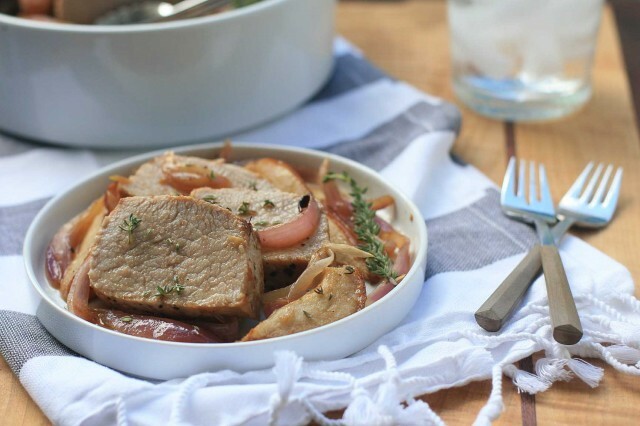 If you’re a fan of the pork and apple combination, I think you’ll really like this one. 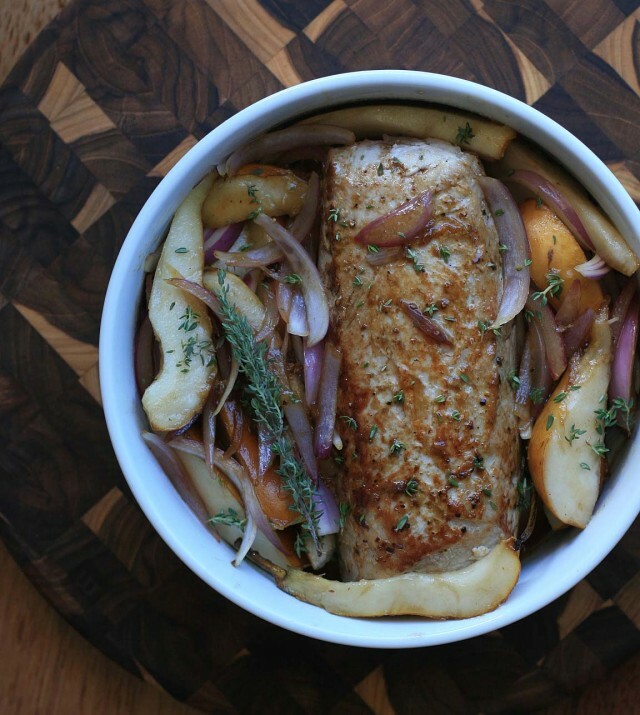 Pears are nestled alongside browned pork tenderloin and wedges of red onion. They soften to create a sweet and savory side- even easier than having to make applesauce from scratch! The tenderloin is coated in a honey-balsamic glaze and scattered with fresh thyme. It’s a quick and flavorful dish, simultaneously rustic and elegant, that can be put together in less than an hour. Perfect for last-minute company or a family Sunday supper. Preheat oven to 400 degrees. Season the pork with salt and pepper. Heat the oil over medium-high heat in an ovenproof saute pan. Brown the tenderloin on all sides and remove to a plate. Add the onion and pears and cook for one or two minutes. Return the pork to the pan and drizzle with the honey and vinegar and then scatter with the thyme. 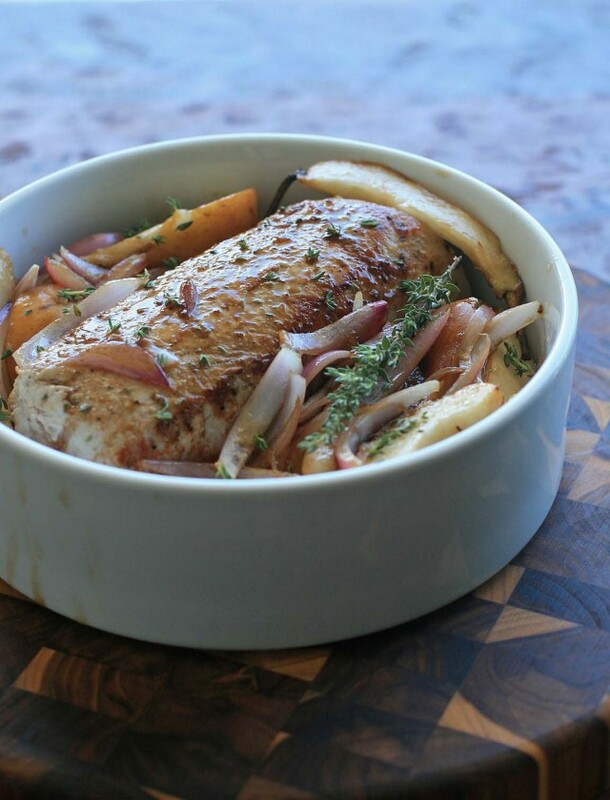 Place the saute pan in the oven (alternatively you can place it in an ovenproof baking dish) and roast until the pork is cooked through and the juices run clear, approximately 15-20 minutes. Remove from oven and let the pork rest for at least five minutes. Cut the pork into thick slices. 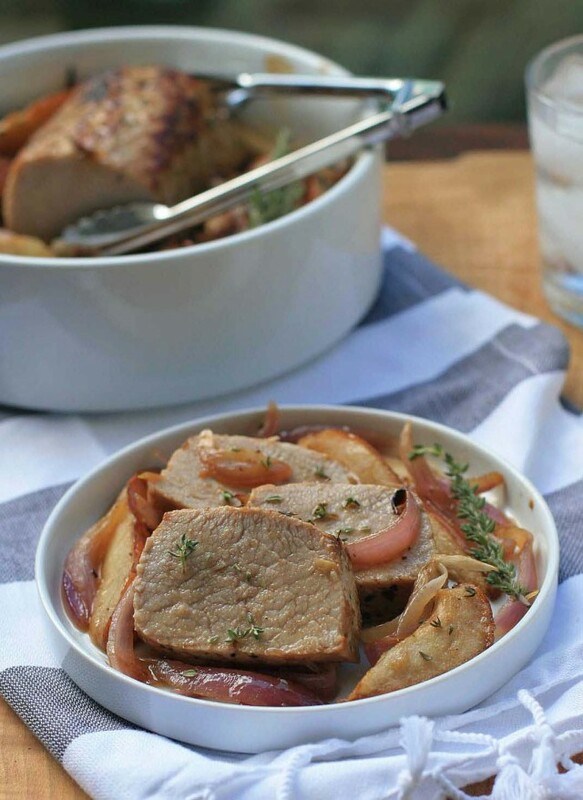 Divide the pork, onions and pears onto four individual plates and then drizzle with the pan juices.